Trees making it difficult to plant grass? Join the club. A love affair with big shady trees makes it frustrating to find sharp-looking plants and groundcovers that will thrive in the shade. It is one of the most often asked questions that my customers ask. This deciduous native fern is tall -- it grows up to 4 feet with 1-foot wide fronds. This fern will tolerate more sun than most ferns, if moisture levels are adequate. Cut it back in August. Also known as a wood fern or Southern maiden fern. Great ground cover for moist shade. Grows into spreading masses. A spreading evergreen that has pale flowers in spring, and of course, loves shade. Prefers good morning sun with afternoon shade. Produces white blooms with yellow, blue and brown markings. On May 6 the Milton City Council gave a nod to a future revision of the current Tree Conservation Ordinance. When the City of Milton incorporated in late 2006, it adopted the Fulton County Tree Conservation Ordinance which was used in the area prior to the City's formation. Now, as the new city is maturing, council has approved a resolution to establish a citizens' participation group to revise or create a new Milton Tree Preservation Ordinance. The city of Sandy Springs, incorporated a year prior to Milton, successfully implemented a whole new ordinance in early 2007. 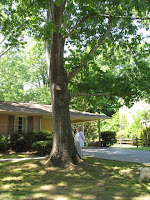 When a community decides to adopt a new or revised tree ordinance in Georgia, the creation of a citizen's participation group or task force is a common procedure in Georgia. Guess the Tree's Age and Win! MikeB over at RegularDad gave me a great idea for this month's contest. Can you correctly pin this tree's age? • The tree is in the Red oak family, most likely a naturalized Scarlet oak hybrid. • It is growing in the Atlanta area. • The photographs were taken last week. Make your guess by post a comment below. The person who comes the closest will receive a winner's link, with anchor text, to their blog or website of choice. Multiple winners are possible, so get at it! Today I was talking to Harefoot, a daily reader of Tree News. He was commenting on how much he enjoyed reading the articles, but he had one concern. "I check your blog every day, but I've been a bit bored with it lately." Really? Do you want more content...more posts...maybe another Tree Care Handbook? "No. I'm bored from that insipid map of Atlanta quadrants." Now it is true that the Arborist Quadrant Map does not exactly meet the quality control guidelines of Tree News. It is also true that this graphic element is a bit too dry for us drought-weary Georgians. But the map does clearly and succinctly illustrate the bold numbers 1, 2, 3 and 4. Understand that Harefoot does not live in Atlanta and does not fully appreciate how exciting the organizational structure of the City Arborist Quadrants can be. So I politley laughed, gave an accepting nod, and quickly changed the subject.